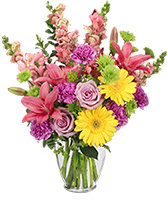 The lovely ginger jar clear vase holds inside it the assorted flowers of roses, iris, alstromeria, liatris, gerber daisies, delphinum and assorted greenery. Bright and beautiful it's perfect for home or office. 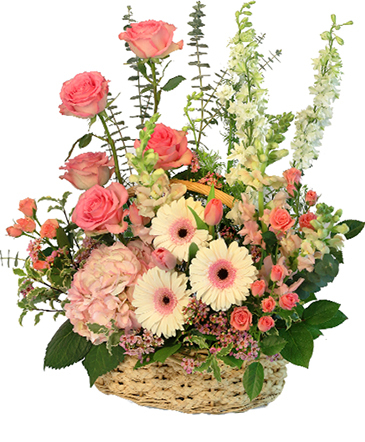 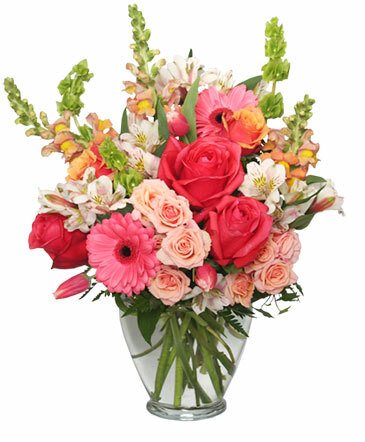 This truly fragrant arrangement of roses and stock is romantic in looks. With delicate ruffled stock and smooth pedaled roses will touch all her senses. Order in Red, Lavender or White. Choose your color and put it in the "additional information" line on our form. 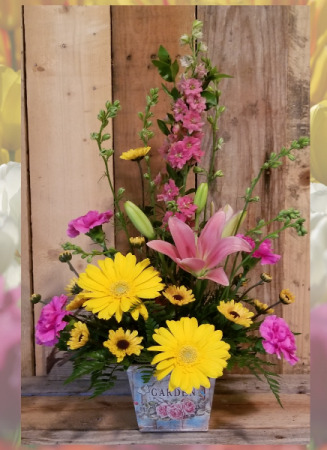 It's Mothers Day, but you can't be there. 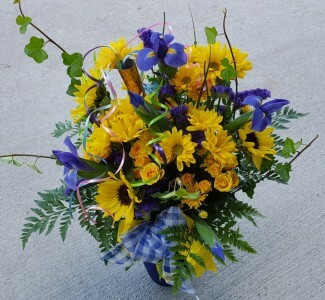 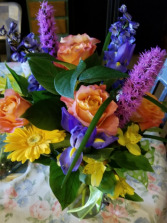 Chase Mom's Blues Away with this beautiful bright yellow and blue flower filled vase to brighten her day and let her know you are thinking of her. 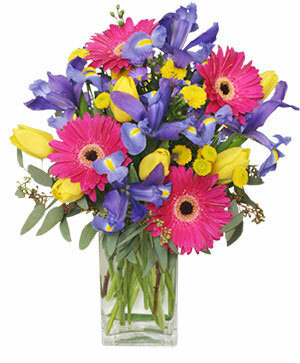 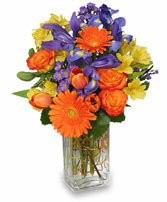 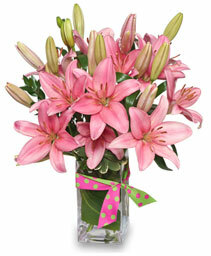 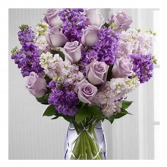 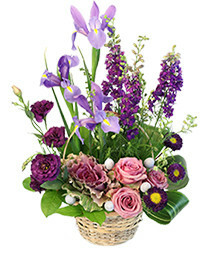 Bright blooms with brighten the face of any who receive this lovely vase of blooms. 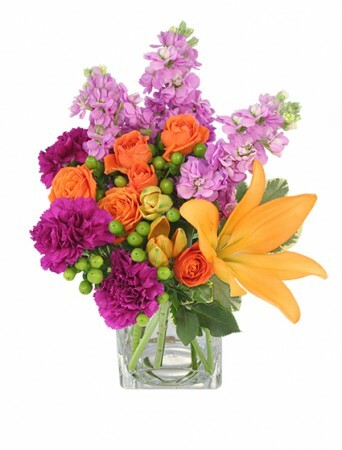 Crisp, vibrant colors and shapes can't help to put and smile on your face. 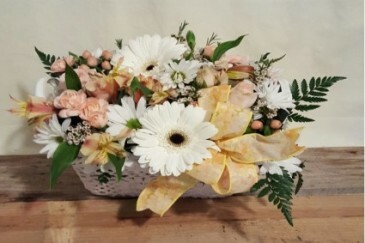 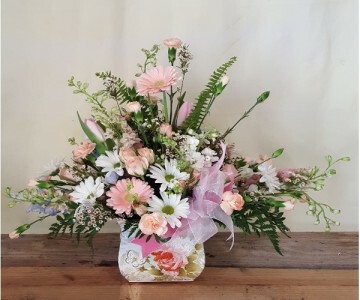 The lovely crocket basket with leather handles frames the gerber daisies, white field daisies, spray roses, alstromeria, wax flower and hyberium berries. 24 hour notice a must on The Deluxe Fruit basket featureing assorted seasonal fruits, boxes of berries, and individual packages of chocolate covered dried berries and cherries, and packages of assorted nuts. 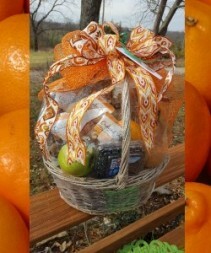 They recipients of these baskets have the enjoyment of eating the fresh fruit in the beginning, yet enjoy the packages of dried fruit and nuts over the following weeks. The Larger basket also include cheese wedges of assorted flavors. 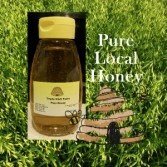 Honey harvested on our farm by us, is golden with light delicate taste. Can be used in tea, to bake with, drizzled over desserts or just eat a spoon full all by itself. 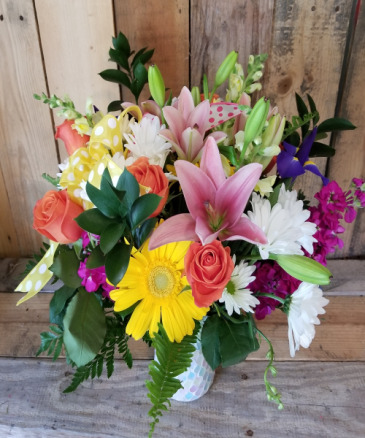 Bottled in our 16 ounce size. 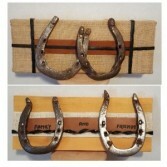 Each of these double horse shoe wall hangings are made on reclaimed pallet wood. 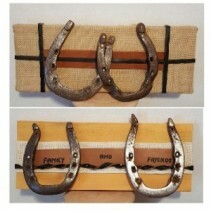 Chose between the crossed shoes or the friend and family design. We will be keeping later hours during the Valentine Holiday.